A feat of TV artistry, the 2018 Q7 blends style and performance. One thin cable attaches everything cleanly to the TV that mounts ﬂ ush to the wall.1 Q Color™ and an anti-glare screen make the Q7 genius. Q | Contrast Plus: Experience dramatic depth with incredibly deep blacks and an anti reﬂective screen. Q | HDR Elite: Step up to Elite class HDR with the power to reveal stunning details and in-depth vibrant colors. 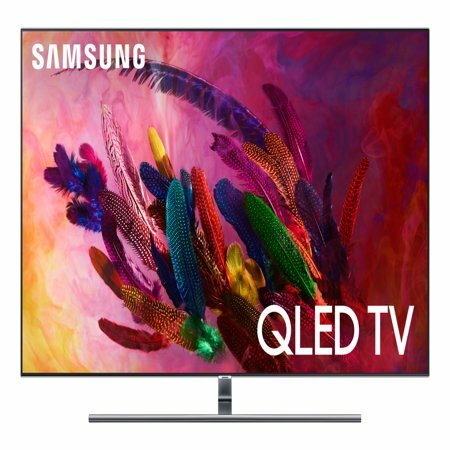 Samsung,QN65Q7FNAFXZA,QN65Q7FN,4K Ultra HD LED Smart TV,65 in. I bought this about 2.5 months ago and I couldn't be happier. I love the one connect box that makes it super easy for me to put all my connections into. The picture quality is amazing and watching 4k UHD movies really blew my mind. The one remote took a little getting used too but now I find it super easy. I control my Apple TV and Sounbar with it and setting those up was super easy. I can also turn on my Xbox with it, but generally I don't since I do need the controller in order to get the full range of options. I recommend searching on the internet for some articles about calibration for the set. Once, I did calibrate it the picture is what I want. Def would recommend turning off the so-called "soap opera" effect which is easy to do in the settings. I do not use the built in apps. If I could I wish you could delete some of the preinstalled ones from 3rd parties aka Direct Tv etc. Since, I already have an Apple Tv I also do not use the Bixby voice since I find that Siri works best if I really need to talk to my Tv. I rarely use the voice functions, because I have no desire to talk to my Tv. Just bought this to replace our UHD TV that was 5 years old. Absolutely stunning. Quite a difference to the UHD. The colors are great. Real blacks, almost too bright reds. The frame less picture screen is nice.The One Connect Box is a good feature. Can hardly see the wire. I still ran it behind the wall as the old set was set up that way. I got the No-Gap Wall Mount too. Nice easy mount. Over all, I like it. Nice TV. I was hesitant to buy a QLED, but much cheaper than a OLED. Glad I bought this, great picture, with a great 2 year upgrade program, made this a no brainer. We bought this TV about 3 months ago and it has been great! The picture quality is absolutely beautiful. This was one of the first big TV purchases we have got and we are not disappointed. I was changing my house and bought this TV and my decision was absolutely right and this TV perfectly fits in my living room. Excellent picture quality and very easy to install. I never write reviews on tech as I have never bought top end tech. But this tv is worth every penny. You won't be disappointed. For the first 2cweeks I had to use the tv speakers.... even they are good. Just go buy it. 4k hdr is amazing. Now it's connect to a 5.1.2 THX system. I may never go to the cinema again.